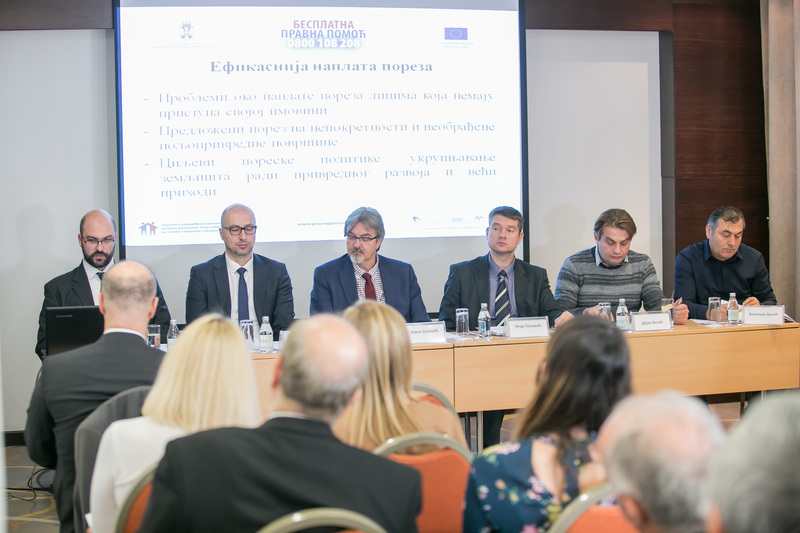 The EU project “Protection and Promotion of Property Rights of Internally Displaced People, Refugees and Returnees Upon Readmission Agreements”, whose beneficiary is the Office for Kosovo and Metohija, organized on Tuesday, November 28, 2017 a presentation of the Draft Report on Strategic Normative Framework for Regulation of Property Rights in Kosovo* and a panel discussion on the influence and implications of Strategy for property rights implementation. Aleksandar Radovanovic, expert for social matters and the author of the report presented the structure and the perception of problems and solutions given in the Strategy from the perspective of Serbian and other non-Albanian citizens whose property rights have been violated. Assistant Director of the Office for Kosovo and Metohija Zoran Bojovic opened the panel discussion welcoming the guests and presenting up to date progress of the free legal aid and pointed out that the project had shown great results in providing free legal aid to IDPs, refugees and returnees upon readmission agreements. 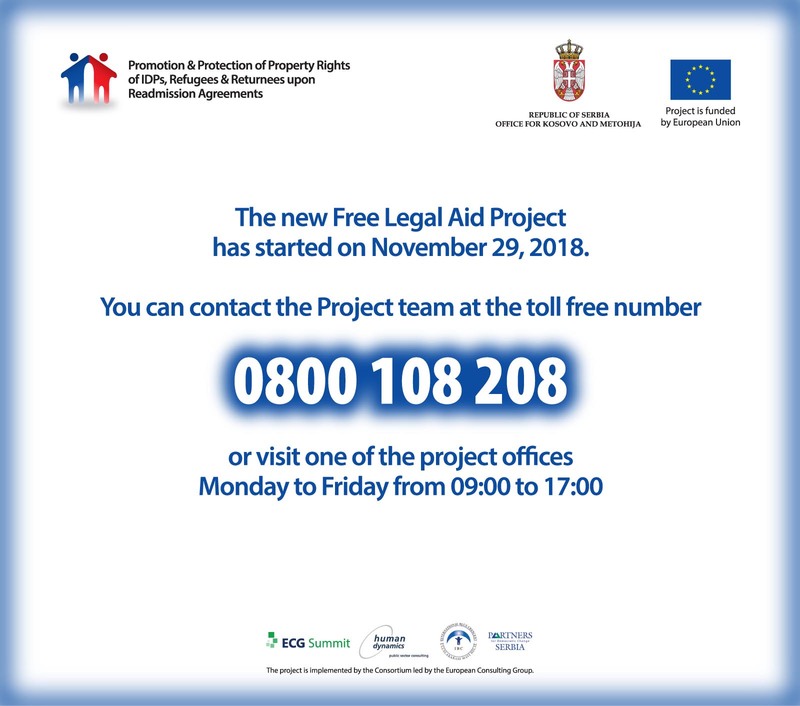 Legal advisers on the project Vasilije Arsic and Dejan Vasic presented through cases they meet with on the field how previous regulations affected unresolved legal property issues of IDPs from Kosovo and Metohija. All the panelists agreed, concluding the discussion, that referencing the Strategy in the process of drafting laws would lead to legalization of a current situation created by force and obstruction of decision executions, at least regarding property of IDPs. Head of the Group for Justice of Kosovo and Metohija stated that the mentioned Strategy, that is incomplete and partial, cannot eliminate consequences of mass usurpation of private properties of Serbs and other non-Albanian citizens, as well as state, public and business property and property of the Serbian Orthodox Church in Kosovo and Metohija. Said Strategy is nothing but an attempt of legalization of the given situation. The Report on Strategic Normative Framework for Regulation of Property Rights in Kosovo* is the fourth report that the free legal aid project presents in purpose of a better and more systematic perspective of the entire process of protection of property rights of internally displaces people, refugees and returnees upon readmission agreements. This panel discussion gathered, besides the representatives of the Office for Kosovo and Metohija and the project’s experts, the representatives of UNMIK, Commissariat for Refugees and Migrations, Danish Refugee Council and NGOs working with IDPs from Kosovo and Metohija.